A four-player co-op survival game with a clever new gimmick… an app. Aliens have invaded the planet. Those jerks. It’s up to you and the team at XCOM to repel the alien invasion, save the day, win the girl, yadda yadda. If you’ve played the video game on which this tabletop title is based, you know the drill. You need to develop your tech to best prepare for unknown dangers, deploy your squad smartly, and be prepared for your favorite sniper not to make it back from a mission. XCOM is a real-time cooperative game. “Real time” meaning that a portion of the game happens with an active timer, removing any chance for in-depth strategic discussions or analysis paralysis. You’ll only have a few seconds to make choices that can have severe impacts on how the rest of the game plays out. Yes, it’s as wonderfully stressful as it sounds. Each player takes on a unique role: Central Officer, Commander, Chief Scientist, or Squad Leader. These roles have specific responsibilities and never cross streams. The scientist will not be leading a squad on a mission and the commander was locked out of the lab after an… incident. Know your role, stay focused on your objectives, and trust your teammates to do their jobs. That sets XCOM apart from many co-op board games. Usually everyone is doing the same things, but each has a special ability that makes them valuable. In XCOM, the roles are distinct and because of the timed elements, you really have to focus on your own responsibilities. Most notable, though, is the inclusion of an app integral to playing XCOM. The Central Officer’s chief responsibility is relaying info to and from the app. The app keeps everything on track and delivers surprises, like telling you aliens are invading the base. It’s a nice app. I call it Appy. Rolling dice is fun. Rolling them 15 times in a row might be a bit much. But, despite its distinctions, XCOM has two crucial failings. The resolution phase (when there’s no timer) essentially strips away the uniqueness of each role. Everyone just ends up rolling the same dice, doing the same thing, and not getting a lot of satisfaction from it. For all the inventiveness of the timed phase, the resolution phase is disappointingly average. The other fault is the difficulty. XCOM is too easy on its normal difficulty. A well-balanced co-op game has to be hard to remain engaging. The thrill is in the chase for an elusive win. We crushed XCOM on our first play through on Normal to the point that I could never bother going back. Though Expert mode whooped us, I sensed we could beat it after a few more tries. And once we’d defeated the hardest difficulty, what thrill would be left to chase? The XCOM App... or Appy, as we call him. 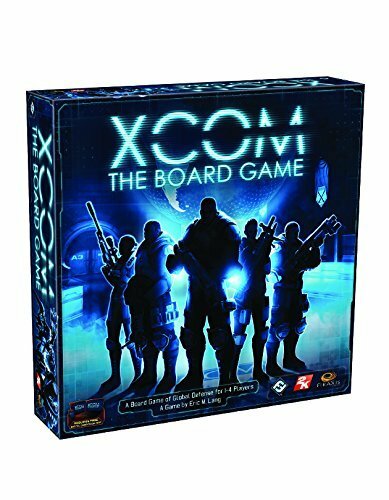 I’ve played through XCOM: Enemy Unknown, the video game inspiration for the board game, twice. Loved it. Want to play it again right now. The Central Officer is in charge of the XCOM app. The Central Officer follows along with the app and tells everyone what to do. Everyone does what they’re told. Players manage their resources in the Timed Phase. In the Resolution Phase, They roll dice to resolve the actions of those assigned resources. Is your base still standing? Do you have less than two countries in the “total panic” ranking? If you answered yes, congrats. On to the next round, do it again. XCOM UFOs in orbit... never a good thing. To its credit, XCOM has enough unique elements that it really doesn’t feel comparable to other games. It stands on its own, for better or worse. You’ve unlocked a ton of cool tech and its enabled you to mitigate disastrous dice rolls and keep the enemy menace at bay. And it’s particularly satisfying when you feel like you’re playing your role well. I watched someone roll dice 15 times in a row. For a game all about acting quickly, sometimes XCOM can feel like a real slog. About as good as it gets for the price. You get a bunch of minis (soldiers, interceptors, and UFOs), a gorgeous board, some nicely designed cards, a free app that is a crucial part of the game, and four custom dice. You may find you really need six or seven of those custom dice, but really, that’s about all that’s worth complaining about. XCOM The Board Game's board. This is not a game for newer players. This is a hefty game that requires quick thinking and doesn’t allow for much help from others. The good news is that the app comes with a tutorial that holds your hand throughout and does a great job teaching the rules. The Commander and the Squad Leader are the tougher roles, so new players should first be the Central Officer or Scientist when possible. XCOM’s requirements for quick thinking, organization, and manual dexterity all feel very anti-drunken stupor. This game would be a disaster to play drunk. And that’s a real shame. These XCOM reserves will come in handy when your whole squad dies. Intense timed phase where everyone is on edge. Pretty much eliminated alpha gamers (people telling others what to do) and analysis paralysis (taking forever to decide what to do). Resolution phase is mostly just watching as people roll dice again and again and again. If the Scientist fails to draw and then develop a handful of essential tech cards, you’re almost certain to lose. Too easy on standard difficulty for a co-op game. Once is all I’ve got in me, folks. But that says more about Mars Attacks than XCOM. You are a fan of the XCOM game series. You love co-op games, but want something that feels different. You want a glimpse into the potential future of board games, where integrated apps are the norm. Questions about XCOM? Ask in the comments. Played XCOM and have your own opinion? Tell us! We may feature you in the Dog and Thimble Podcast.